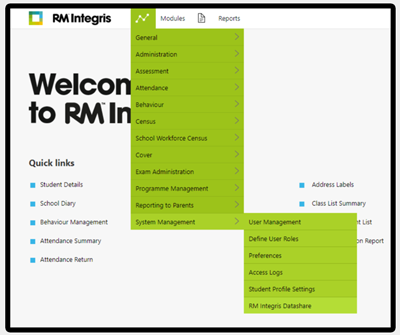 RM have released a new data integration platform, called Integris DataShare, allowing software providers access to data held in Integris. This platform replaces the old RM WebServices API, and all existing integrations must be migrated to the new Integris DataShare platform. 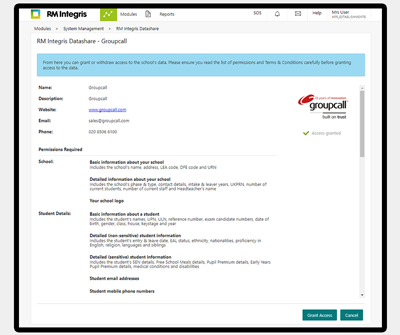 Schools will need to authorise Groupcall Xporter on the Integris DataShare platform to allow their existing integrations to continue to work successfully. 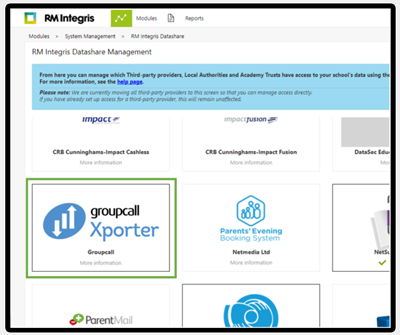 In order for Xporter to work with the RM DataShare API, you need to enable Groupcall Xporter in the DataShare Portal in Integris. a. Review the information provided in the portal regarding Xporter. Remember, when using Xporter, Groupcall only provides the information you specifically agree to for each third party using the Xporter service. You can check what each partner requires in the specific data sharing agreement you hold with them. We will now be able to setup your Xporter feed to provide existing third parties access via the new DataShare API. Moving forward, you will also be able to authorise new third parties to access your data via the Xporter On Demand platform. Groupcall can automatically see when you have activated the feed, so you don’t need to contact us to let us know once you’ve done it. If you have any questions regarding activating an integration partner via the RM DataShare portal, please contact your RM support provider. If you have any queries regarding Xporter or Xporter on Demand, please contact support@groupcall.com. Q: How do schools let Groupcall know they have activated Xporter on Integris DataShare? A: Groupcall can see all schools who have been activated for Xporter within 10 minutes of the school allowing access via the portal. Schools don’t need to call to let us know as we’ll be able to see automatically. Q: It looks like you are accessing lots of data! Why are you collecting all of this information? A: Groupcall Xporter has been configured in the Integris DataShare portal to request all available permissions, this means Xporter is able to support data items for any linked partner data feeds that the school are using. For Xporter Bespoke data feeds, we will only request data from the endpoints that are specifically required for that feed. The new Integris DataShare API is more granular than the old API, so we will in fact be accessing less data than before. We will only provide the specific information to a partner in a data feed that has been requested by the partner which the school will have agreed in their data sharing agreement. Schools should refer to the data sharing agreements provided to them by their software providers. Please view the Groupcall Messenger data sharing agreement here. For Xporter On Demand feeds, schools must authorise the software provider for the specific data areas needed in Xporter On Demand itself, providing an additional layer of audit and protection for the schools’ data. The Xporter On Demand data sharing agreement can be found here. Q: I have a link to Messenger (using Xporter) – will it work on the new Integris DataShare API? 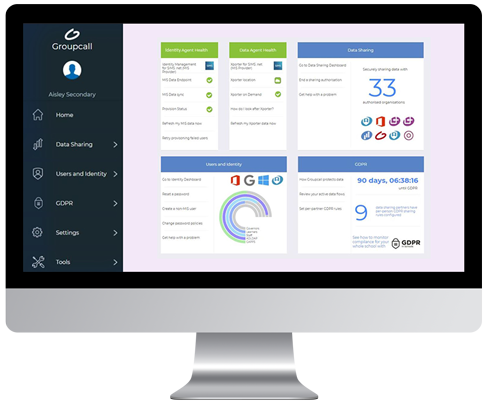 A: Groupcall are working with our partners to migrate all existing integrations across to the new Integris DataShare API. This process is happening now and we just need schools with an existing integration to enable Groupcall Xporter in the Integris DataShare portal so we can get them moved across. Some partners have made the decision to move to Groupcall’s Xporter On Demand platform which will mean their schools will need to authorise the data feed in Xporter On Demand itself. Partners will provide guidance to schools if this is the case.